The trick to slimming down the appearance of your face lies in strategically placed light and dark shadows – a technique coined contouring by the world’s best make-up artists. Providing A-listers with chiselled cheekbones for decades, this method of applying make-up is fiddly but if applied well, completely face transforming! 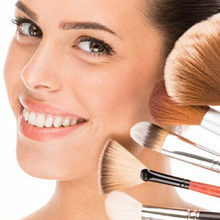 To start contouring, apply your normal foundation (one that matches your skintone exactly) across the whole of your face as you usually would. Then select a second foundation which is at least two or three shades darker than your original one and apply it to the darkened sections outlined on the accompanying image. It might look a little strange at first, but trust us – once everything has been blended, you’ll love the amazing definition that contouring gives. Using two contrasting shades of base is the quickest way to streamline your features and can even dramatically change your face shape. Dusting a darker shade along the hairline can transform any face shape into a desirable oval or even shorten a long forehead. 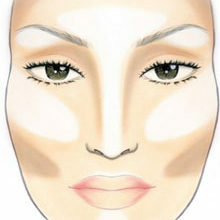 Similarly adding lighter shades to the centre of a small forehead will make it appear larger and you can even use contouring to slim down larger noses. What’s our favourite trick? Getting rid of those pesky double chins! 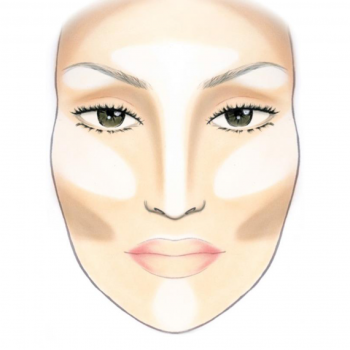 It may sound a little tricky, but once you learn the basics of contouring, you’ll never go back. Whatever the dimensions of your face we have devised a step-by-step guide to help you look your best. You can choose to follow as many or as little hints as you like.